Vertical text ribbons may be customized to fit any need. Choose from a variety of fonts and ribbon and imprint colors. 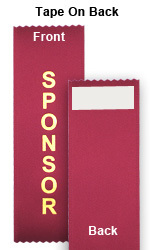 If you need a graphic or a logo on your ribbon, order Vertical Logo Ribbons. SET-UP FEE: $9.50 for each unique set of ribbons (a set includes any changes in layout, text, ribbon color or imprint color). 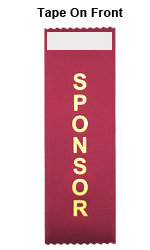 Custom ribbons are available in 8 sizes and 35 ribbon colors. Each ribbon has pinked edges on the top and bottom to prevent fraying. Custom sizes are available; contact customer service to order. 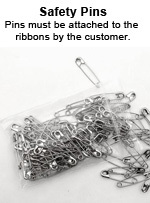 MINIMUM ORDER: 25 ribbons, titles and colors may be mixed; no minimum on individual titles. SET-UP FEE: $9.50 for each unique set of ribbons (a set includes any changes in layout, text, ribbon color or imprint color). * Expedited Fee: $50.00. Expedited production may not always be available; customer service will contact you if we are not able to meet your need by date. If a metal stamp is needed to complete the order, add two additional business days to the total production time. Text that will be less than 18 pt in size (text over 20 characters or long words that cannot be split). Imprint colors that require a metal stamp (these will be shown in the selection field of the order form). More than 1,000 ribbons per title (the ribbon colors may be changed). 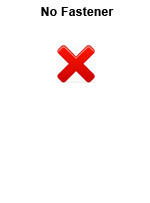 We do not recommend mixing polymer and metal stamps on the same order. STAMP FEE: $20.50 for each ribbon title. PRODUCTION: A metal stamp will add two additional business days to the total production time.